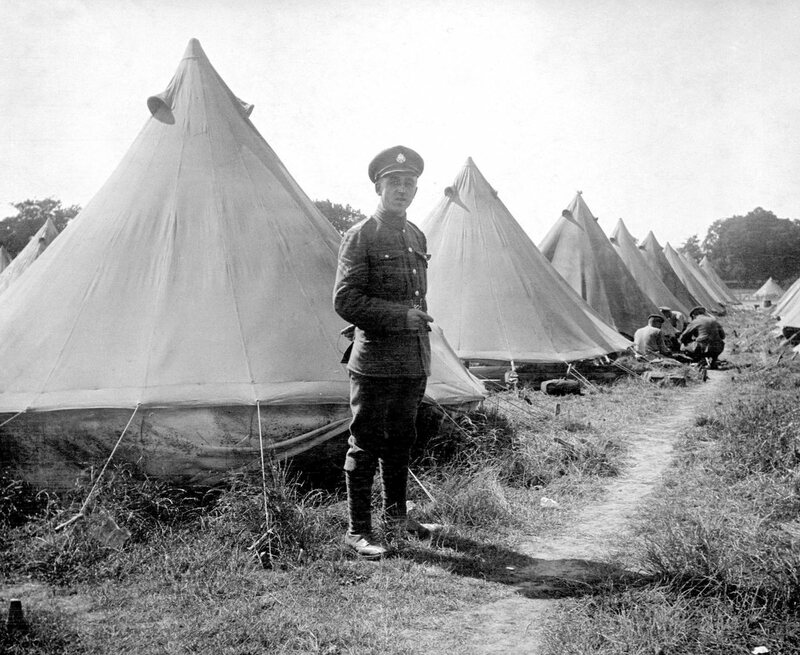 Tents were the basic standard of troop accommodation for British and Empire troops during the Great War. 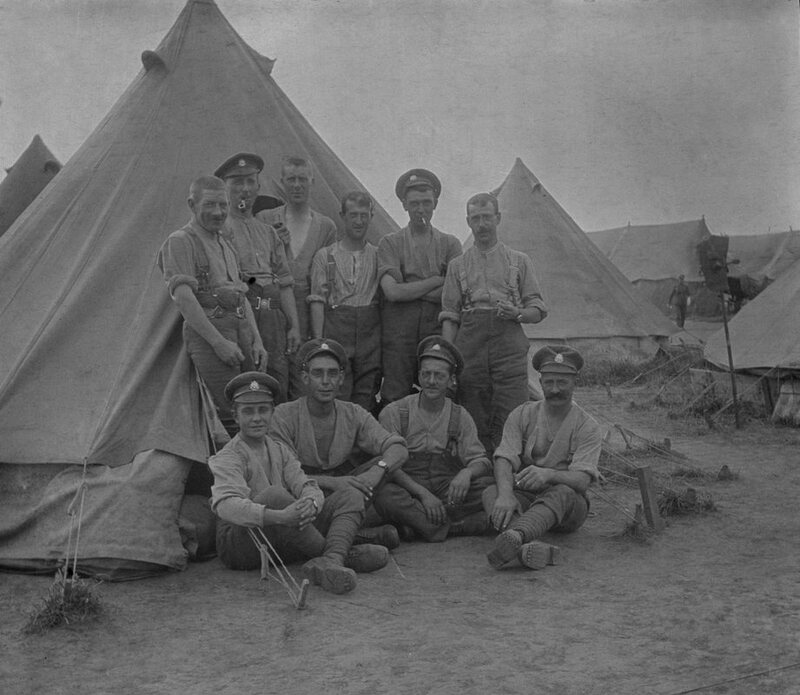 I thought it might be handy to create a thread to document British and Empire tent identification, usage and lore. 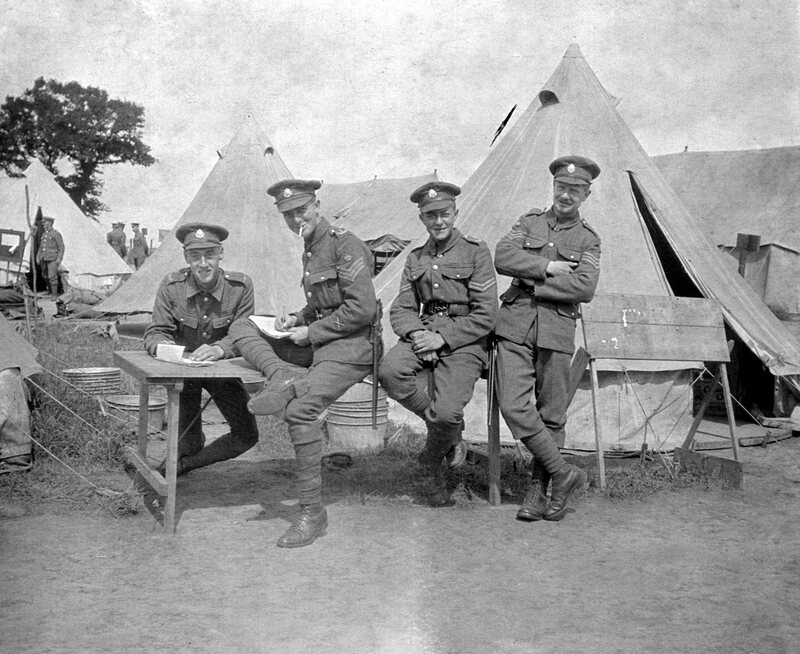 To be honest, I don't know that much about Great War-era tents, which is where you come in... if you have any further information or photos or have discovered errors in this post especially, please let us know. I'm learning about these tents as I go. Note: I'll continue to edit this post as new information comes to light. A troop tent at a recruit training depot at Enoggera in Queensland during 1916. The tent was occupied by either 9 or 8 men and as can be seen by the serial "QDF 704" stenciled above the door, it is a pre-1901 tent from the former colonial Queensland Defence Force. 4. Great War/Second World War era Mk V "single" circular tent. 12.5 foot diameter. These were standard troop accommodation from Gallipoli to the Western Front. They usually accommodated 12 men with their kit. The occupants slept foot to pole, arranged in a star-burst layout. Tent Circular, Double at the Australian camp at Kantara, Egypt in 1918. The "doub;e" refers to the double layer which can be seen via the open door flaps of the tent. 6. "EPIP" circular tent. Used widely in Palestine and Egypt. "EPIP" is an acronym, the meaning of which I am unsure. I have seen it defined as "Eight Personnel India Pattern", "Eight Person Indian Pattern", "European Personnel Indian Pattern", "European Private's India Pattern", "Egyptian pattern, Indian patent" and even "English Pattern Indian Product". The tent can be easily identified by the tall peak and the lack of an eave above the wall section. During the Second World War, troops in the North Africa theatre were issued with EPIP tents, but these 1940s versions were of a different pattern, and described as square rather than circular. EPIP tents and 2-man bivvies at the Australian Light Horse camp at the Deir el Belah oasis, Palestine January 1918. At rear of image, across from the line of horses can be seen three standard British circular tents. 1. Mk I shelter. Originally called a Tente d'Abri before being designated Mk I. It is described in several of Wolseley's miltary books from the 1870s. It was a two-man bivouac shelter constructed from two purpose-made waterproof sheets fastened together in much the same way as US shelter halves/"pup" tents. Early versions were 8' 6" in length and later reduced to 6' with two 4' ash poles. Usually made of white duck canvas. What appears to be a Mk I shelter in use by Australian Light Horse at an encampment in Palestine, 1917. 2. Mk II shelter. Two-man bivouac shelter introduced in Nov 1914. It was 6"long by 4"high and the shelter was of one-piece rather than two sections like the Mk I.. The Mk II was open at one end and closed by flaps at the other. Originally manufactured in white cotton duck but later changed to Khaki by at least 1916.This was issued with two weather lines, 6 loop lines, two poles made of ash and 4' high, 7 small pins and 1 tent mallet. I believe that a variation of this basic shelter soldiered on in UK service into the 1990s as the Tent, Bivouac, Cotton Duck 8340-99-210-6699 and it differed from the WWI-era Mk II shelter only in that it had a lower profile (3 feet high instead of 4 feet high like the Great War-era Mk II shelter), the open end was closed in by a vertical canvas panel, and some variants were fitted with mosquito netting. Painting by H Septimus Power depicts an AIF encampment in Flanders, 1917. Tents are Mk II shelters. 3. Improvised Bivouac shelters. Also called d'Abri, these were improvised from service blankets or groundsheets. The "official" method of constructing a d'Abri was to lace two groundsheets together along the long side, and then pitch the resulting shelter as an "A" between two poles, sticks or trees. These were ridged wall tents. Will update as more info comes to light. 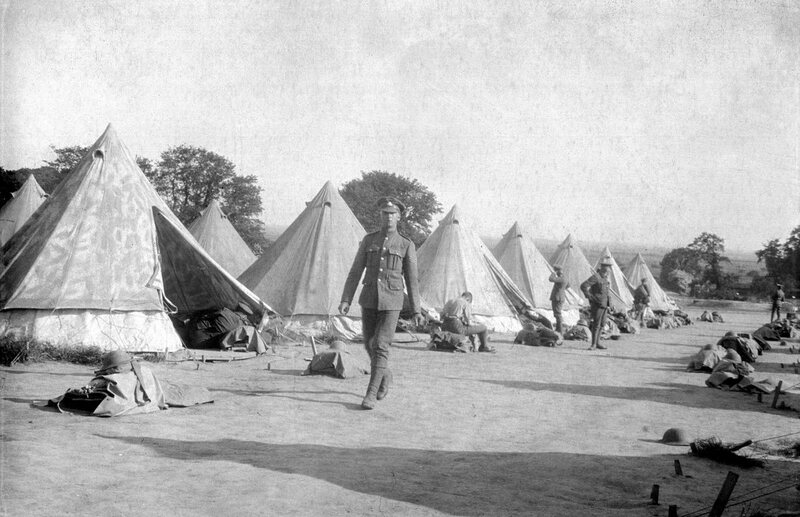 Here are some tents in British Army usage, during 1-28 Londons training in March 1915 before deployment to France. Thanks for the reply Kim, most informative. I note with interest that the tents used in the camp shown appear to be the shorter Victorian-era type. The author of the document, Clive Elliot discusses the Mk. 5, the last mark of traditional circular tent which was in service from the 1930s until they were retired beginning in the 1960s. I have heard anecdotal evidence that these tents weren't finally declared obsolete and replaced in some UK Territorial units until the 1990s. In Australian service these types of tents had been completely replaced by various ridged wall tents by the end of the Second World War. According to Clive Elliot, the designation for the tents was "Tents, C.S.". C.S. meant Circular, Single, which meant a single-layer tent. Another type was called the "Tents, C.D.". C.D. meant Circular, Double. CD tents were used in particularly cold weather and were double layer canvas. How different to the Mk 5 model were the Great War era models? I can't quote specifications or types, however these were still in widespread use in the 1940's and 50's. There was one in my Boy Scout troop in the 40's and I recall them in large numbers at JTC camps in 1949 and 1950. Thanks for the post Old Tom. It's amazing these old tents were still in use in the 50s! - The Tent Circular Single has a radius (?) of 9 3/4 feet. 1 x General, Colonel or Commanding Officer. Mark centre with peg. Describe a circle, with a radius of 4 paces, on which the pegs will be. In this circle, drive in the two pegs opposite the door of the tent, one pace apart. At 3 paces from these pegs, on either side of them, drive in pegs for guy ropes. The other guy rope pegs will be 5 paces from these and 5 paces from each other. Put up tent. Pole to be set and kept perfectly upright. Drive in the other pegs, which should be one pace apart and in line with the seams of the tent. Doors, if possible, point to leeward. 7 1/2 yards from centre to centre of tents. Cut drains round bottom of tent walls and heap earth inside flap. Dig a hole 6 inches deep close to tent pole, then if heavy rain comes on suddenly, the tent pole can be pushed into the hole and much strain is taken off the canvas, ropes and pegs. According to the specs above, if these tents they are describing have a radius of 9.75 feet then that's a diameter of around 19.5 feet/6 metres. Could they be describing the larger "16 foot" tents? The Circular tents were carried in a Valise MKII which was 3ft 8inX 2Ft 6in. The Pole MKII was 11ft 10in and in two pieces, the pole MK III was 9ft 9in and also in two pieces. WWI were the same as Boer era Bell tents except the MKIV was used in the Boer War which had 24 bracing lines-The MK V used in WWI had 26 Bracing lines--no difference in weight. Marquee, Hospital-Large--35'X17' not used for Bivouacs. Marquee, small, double --31'X16' . Marquee, small, single --31'X16' . Shelter, MKI---Two sheets, early versions were 8' 6" in length and later reduced to 6' with two 4' ash poles. 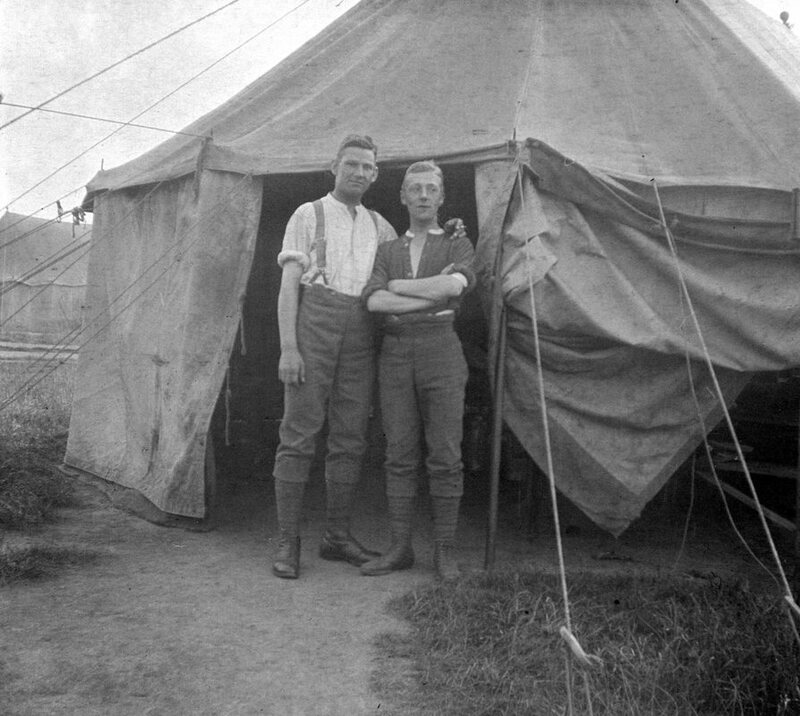 Two man tent early in its existance (circa 1862 LoC 443) was called a Tent d'abri later MKI (Oct 1908 LoC 14290). Usually made of white duck. The term Tent d'Abri later became to mean a tent made up with field expediant items such as groundsheets and blankets. Shelter, MKII---Introduced in Nov 1914 (LoC 16936) was 6"long by 4"high. Two man--did not disassemble was open at one end and closed by flaps at the other. First ones were white cotton duck but later changed to Khaki--Khaki ones dated 1916 are encountered. This was issued with two weather lines, 6 loop lines, two poles made of ash and 4' high (Same as the MKI), 7 small pins (Wood-13") and 1 tent mallet. The MKI came with the same equipment list but came in two sheets and disassembled. Store Tent--not used for Bivouacs. Thing you should keep in mind is that none of the tents were issued at the unit level for fighting troops (regimental, Battalion, or battery) as part of the mobilization stores. This included the shelters. They were not carried by the soldier nor carried in the Battalion transport. These were only issued as needed in rear areas. Interesting topic. I have always known these as 'Bell' tents, which as far as I can see, hasn't so far been mentioned #. My understanding is that these were popular with youth organisations (Scouts, Guides, Boys Brigade etc) for standing camps between the wars and immediately post WWII. I would guess that this was probably down to the ready availability of cheap army surplus stock. So, according to http://www.hmvf.co.uk/pdf/TENTS Version 02.pdf the WWII era Tent Circular was the "Mk 5" and this was introduced in the 1930s. 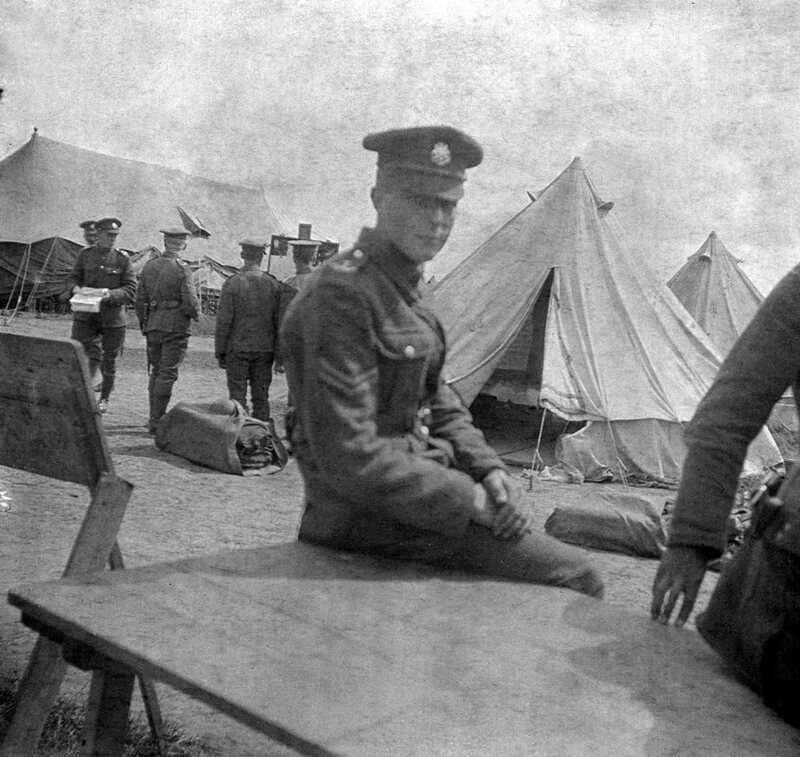 However, Joe Sweeney (quoted above) states that the Mk V tent circular was the one used during the Great War, with the Mk IV being used during the Boer War. What would explain this discrepancy? Did the British War Office change their nomenclature for the various marks from roman numerals (Mk V) to arabic numerals (Mk 5) in the 1930s? If this was the case, then the WWII-era tents circular would be the same pattern as the WWI-era tents circular? Or am I way off the mark? I don't know if the term "bell tent" was used during the WWI era or whether it was a more modern term. As for surplus tents being used by youth groups post-war, they certainly were popular. 3 ventilators near the top of the tent, each 58cm long. The tent closures are brass hooks and eyelets rather than dutch lacing. other party deleted the post I was replying to. ...I don't know if the term "bell tent" was used during the WWI era or whether it was a more modern term. As for surplus tents being used by youth groups post-war, they certainly were popular. A 1905 Canadian patent (use 'original document' at top left to view) https://worldwide.espacenet.com/publicationDetails/originalDocument?CC=CA&NR=91639A&KC=A&FT=D&ND=3&date=19050221&DB=EPODOC&locale=en_EP indicates that it was; The Oxford English Dictionary also gives '1785 Roy in Phil. Trans. LXXV. 393 One of the pyramidal *bell-tents‥being placed at the station', although it's not clear that it's a circular version that's actually being referred to. 2/5th Battalion East Surrey Regiment 1917 in Kent. Original photos taken from my ww1 negatives. Thanks Nigel. Looks like the term "Bell Tent: has been use for a long time. Interesting patent document too. Thanks for the link. It looks like a standard circular tent with a plethora of extra ventilators added to the peak and a "drip strip" added around the eaves. Re: the use of these tents by youth groups post-war I found some photos of one on Flikr which could very well be the same ex-girl guides tent I was in the running for. Tent is now in use by an Australian Great War reenactment group. Tent is described as 14 ft, ex-Girl Guides. Fantastic photos Keith, thanks for posting them. I notice with interest that the tent closest to the photographer in the first picture appears to have had camouflage patterned dye or paint applied? Since the tents were originally white, I wonder when instructions came through to dull them down? Australian army recruits at Broadmeadows army camp in Victoria, Australia 1915. The men's giggle hats are white, so the tent in the background must have been dyed or painted. A camouflaged AIF tent at Potijze Farm, in the Ypres Sector, October 1917. Aaside from the vegetation stacked up against the tent, the tent appears to have been painted too. In a camp environment tents were typically pitched on wooden platforms. This kept dust down, and in damp climates stopped the floor of the tent turning to mud. A very important consideration if your gear had to be presented for inspection every day. 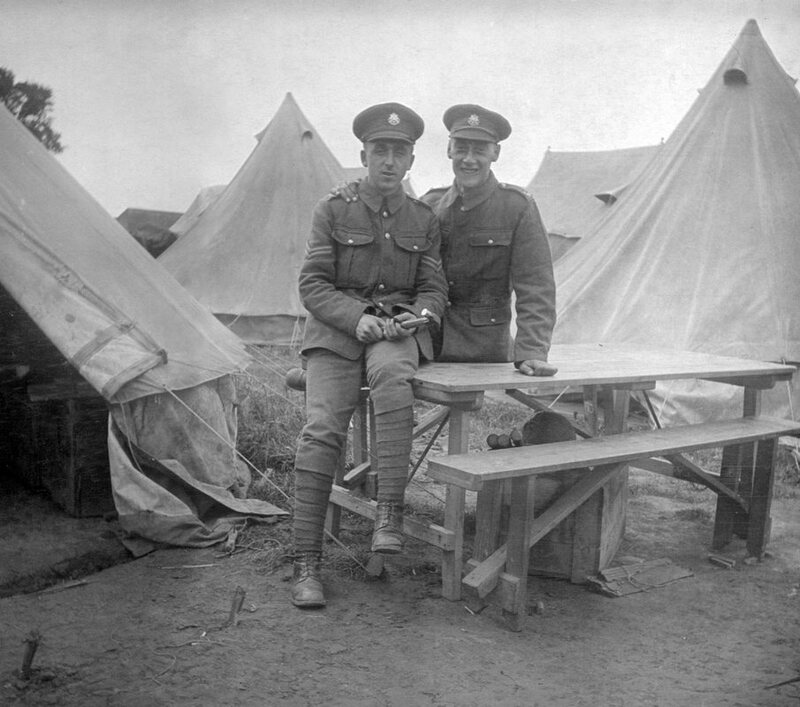 A pair of armourers working in a makeshift workshop at Tadworth Camp in the UK - The workshop is a standard circular tent with wooden flooring. Groundsheets were commonly used for temporary encampments, but for those closer to the front lines, shell scrapes were often dug inside the tent which offered a bit of extra protection beyond the sanbagged walls of the tent. Lt Henry Horace McKeown of the 11th Brigade Artillery reading inside his tent at Saint-Souplet in northern France in 1917. He is sitting in a groundsheet-lined shell scrape dung into the floor of his tent. painting by George Bell. The artist, George Bell, skilfully picked out miriad details with a few strokes of the brush: binoculars case; Sam Browne cross-strap; high laced-boots, and especially the horses placed under the trees. In 1917, Lieut H. H. McKeown, presumably AIF, had a long way to go before Return to Australia. Hi Kim, the artist certainly got the little details right. It's a shame I didn't - the tent Lt McKeown is using is some type of ridge tent rather than a circular tent. During the war, Lt McKeown served with the Australian 7th Light Horse Regiment in the middle east before transferring to artillery. At the time the painting was created, he was with the 11th Brigade Artillery in France. He remained in the army until 1920, going on to serve with the 1st Light Horse and at time of discharge he was a Temporary Captain. I have updated and reorganised the original post, and have included several types of shelter/bivouac tents. Includes page 106 Manoevres in Egypt [March 1914] which refers to tents used, which appear to be Indian Army tents. tents G.S. India 160lb single fly, suitable for pack-mule, or camel transport. Thanks @Maureene, I haven't yet delved into the mysteries of the various ridged "pounder" wall tents. I do know there were two styles - standard, and the Indian Patterns, which usually had a higher roof for better airflow in the tropics. I've updated the original post with placeholders for these Indian Pattern lb tents. I was sleeping in a bell tent this year at Passchendale and although I can't tell much about the dimensions I can tell you that if the pole goes through the roof at night the swift insertion of an enamel mug between pole and hole can keep the tent up until a more permanent repair! Interests:British Military History, Steam Traction Engines, Large noisy Motorcycles. Thought you might like to see this company from Antwerp, British Army Tents. They are bringing out a range of authentic tents, sadly the link does not work but you can find them on Facebook. A few more from my Original photos taken from my ww1 negatives.